What happens when a vendor adds 802.11ac to Killer networking? You get an ACK - specifically, the MSI X299 Gaming M7 ACK. This motherboard includes 3-way SLI and Crossfire support, dual M.2 slots with a unique heatsink design attached to the chipset, both front and rear USB 3.1 (10 Gbps) ports, dual Realtek audio chips, Killer based networking, and plenty of RGB LEDs to light up the case. With the X299 platform, users tend to drop into one of two categories: the all or the nothing. A user investing in X299 is either trying to get everything, every feature, with multiple graphics cards and displays and lots of memory, or they are trying to get the high-end on the cheap. I remember the days when investing in X58 to get a Core i7-920 and overclocking it was seen as the height of aiming at performance, compared to investing in a Core i7-800 series platform. Back then, X58 was a stepping stone into HEDT. 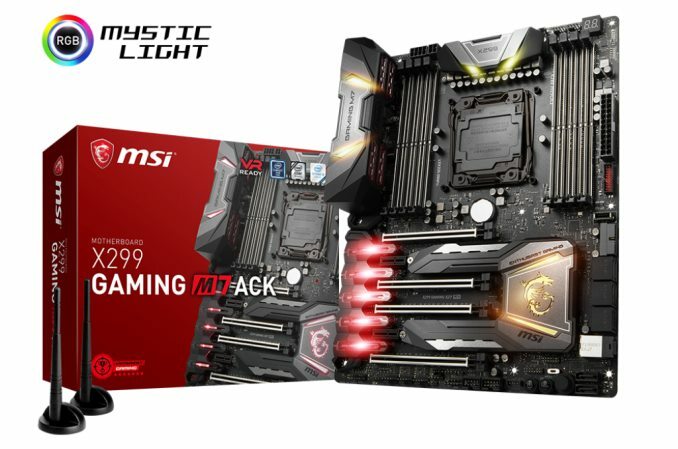 But here, the MSI X299 Gaming M7 ACK, or M7 ACK for short, is clearly aimed at users who want it all: more cores, more memory, more graphics cards, more storage, more network connectivity, and most importantly, more LEDs. If you wanted to light up the night, this is one motherboard that can certainly do that for you. Aside from features and LEDs, there is one consistent metric in all motherboard reviews. Our performance results placed the M7 ACK right in the middle of the pack, performing well overall. The form of Multi-Core Enhancement it has runs the benchmarks in the 3.6 GHz range, as do the majority of other motherboards tested. The main system performance win was the fact that it was the fastest MSI board to boot that we have tested so far. But users investing in this system should look into the overclocking. Manually overclocking our Core i9-7900X was met with little fanfare, as this board happily took our i9-7900X CPU to 4.6 GHz before running into our temperature limit. Using the automated OC tool, Game Boost, was a different story. We were only able to reach the 2nd boost level before the CPU was throttling due to the voltage causing temperatures to be too high for the settings. Through it all, the smaller heatsink covering the VRMs did a good job keeping temperatures to an acceptable level during our extended stress testing peaking at 75C while overclocked to 4.5 GHz. The M7 ACK allows users to have all the options for storage connectivity. There are eight SATA ports along with two M.2 slots. These slots are both covered by the unique hinged heatsink attached to the chipset heatsink. Both M.2 slots support PCIe and SATA modules, and share bandwidth with the U.2 port and SATA ports. The board comes with four full-length PCIe slots in positions 1, 3, 4, and 6. Those slots are all connected through the CPU and intended for video cards. PCIe slots 2 and 5, both PCIe 3.0 x1, are connected through the chipset. For connectivity, there is a total of four USB 3.0 ports (three managed by ASMedia 1074, one by the chipset), three USB 2.0 ports (chipset), and two USB 3.1 ports (Type-A and Type-C, ASMedia 3142) on the back panel. Internally there are additional headers for both USB 3.0/USB3.1 as well as two USB 2.0 headers. For networking, MSI chose to go with an all Killer-solution here. The board uses Rivet Networks latest Killer E2500 NIC for wired duty and the Killer Wireless-AC 1535 module for wireless, which comes pre-installed in the M2 (Key E) slot. The 802.11ac module supports Bluetooth 4.1 and speeds up to 867 Mbps. The networking is built into the name of the motherboard - Killer networking and 802.11ac gives 'AC' and 'K', for ACK. Pricing for the MSI X299 Gaming M7 ACK is $390 at Newegg and $365 (from $420) at Amazon. This price point puts it in some decent company in the the $350-$400 range including the ASRock Fatal1ty X299 Professional Gaming i9 currently listed at $390 (from $399), the ASUS ROG Strix X299-XE Gaming at $370, and the GIGABYTE X299 AORUS Ultra Gaming Pro priced at $350. If U.2 is needed, the MSI board is the hands down choice, otherwise, users will need to filter through faetures they need and want as well as consider looks and price. 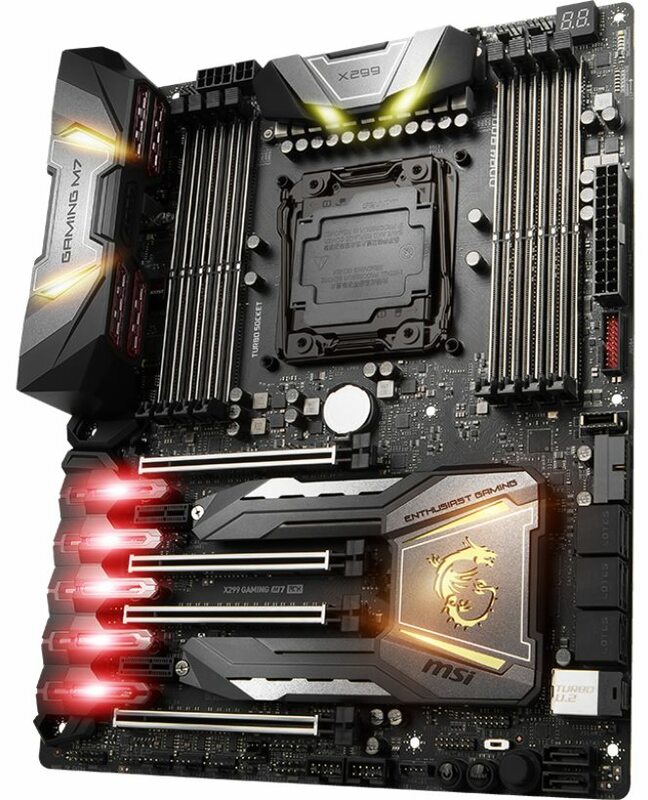 MSI brings a current total of eleven X299 boards to choose from: the MSI X299 XPower Gaming AC holds the flagship title and makes its home in the Enthusiast Gaming segment along with the X299 Gaming M7 ACK. There are a total of three boards in the Performance Gaming hierarchy in the X299 Gaming Pro Carbon AC, Gaming Pro Carbon, and X299M Gaming Pro Carbon AC (mATX). The Arsenal line carries the three Tomahawk boards, the X299 Tomahawk, the X299 Tomahawk Arctic and the X299 Tomahawk AC, while the Pro lineup for professionals has three motherboards; X299 SLI Plus, X299 Raider, and X299M-A Pro.